Doyle prodded home from close range to cancel out Offande Zanzala’s opener for Stanley, who were ultimately good value for their point. He netted at the start of the second half. The hosts, without the influence of Tom Bayliss and right-back Dujon Sterling, started with Abu Ogogo and Jordon Thompson in their respective places. In a first half that was tight and with few clear cut openings, the Sky Blues edged proceedings. Luke Thomas caused uncertainty in the Stanley defence when he wriggled free on the right and whipped a dangerous ball across goal with his left foot, but the away side survived. Thompson’s diagonal ball then won a corner, which Thomas floated in invitingly. Jordan Willis met it and should have headed home, but instead he fired it over. 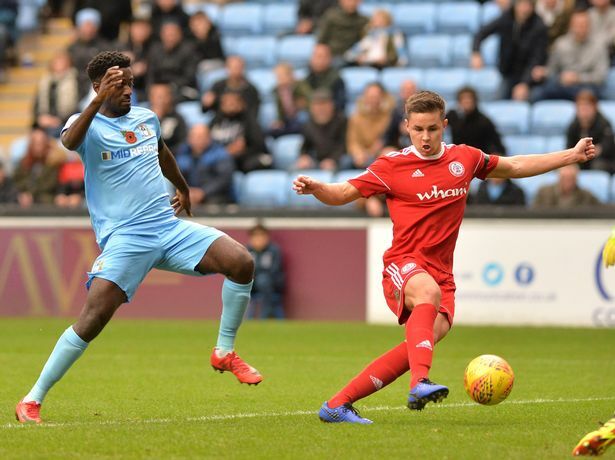 Hiwula then sent the ball wide to Brown as Coventry visited the Stanley box once more, his deep cross finding Jonson Clarke-Harris at the back-post, and his knock-down was prodded goalwards by Chaplin. Ripley was forced to stride backwards and tip the ball over the bar. Poor defending from Davies and Willis soon allowed the ball to bounce in the box and Jordan Clark nipped in and shot. He perhaps ought to have done better, from the position he was in, but mercifully he thumped the bar. Stanley looked the side who would open the scoring by the way they began the second period. City survived a string of corners, before Zanzala danced free in the area and unleashed a shot beyond Burge. Robins introduced Jodi Jones and Liam Kelly in the hope that fresh legs would bring a renewed vigour to his side. It worked; the former received the ball on the left, and fired a cross shot towards goal. Ripley could only parry the effort, and Doyle was on hand to tap home the rebound.